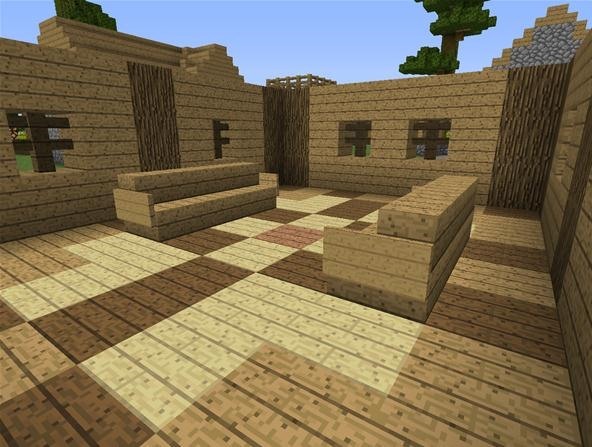 Flooring is a very important part of your Minecraft builds. I've already shown you the three types of flooring designs and went into further details about inset flooring. Now it's time for the second main category of floor types—patterned floors. 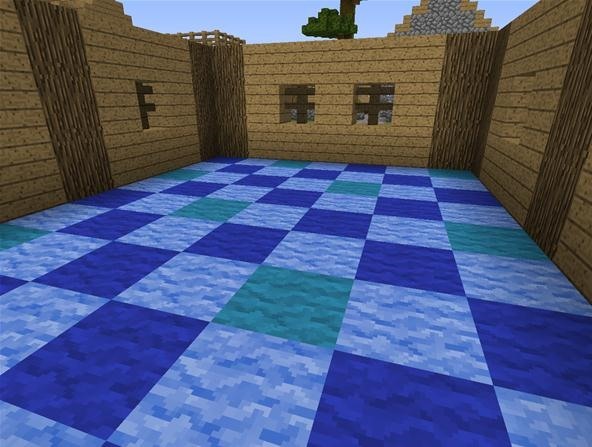 Patterned floors use two or more blocks to create some sort of design in the floor. This can range from a checkered layout to a symmetrical pattern. Oftentimes, patterned floors help builds look more modern, especially when using checkered patterns. This floor is just a checkered pattern of iron and pine tree leaves. The two blocks contrast very well, yet also compliment each other. These floors look great in modern-style dining rooms. 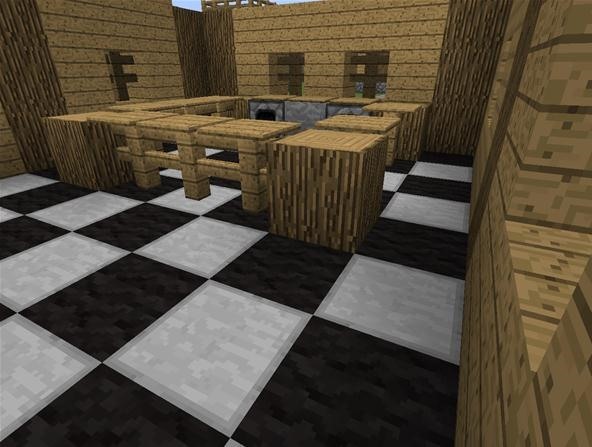 This type of patterned floor is another checkerboard floor, but this time using black wool and stone slabs. Once again, these two blocks contrast each other very well, but not too much. A good application for this floor is in a kitchen. 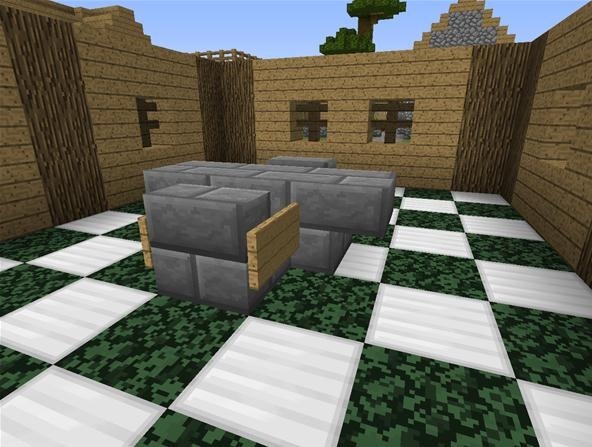 The last of the three checkered floors I will cover, this floor consists of end stone and netherbrick. These two blocks do not contrast each other as much as the others, yet still look great together. A use for this pattern is a lobby/foyer. This type of floor uses several blocks to create a more complex pattern than just a checkerboard. 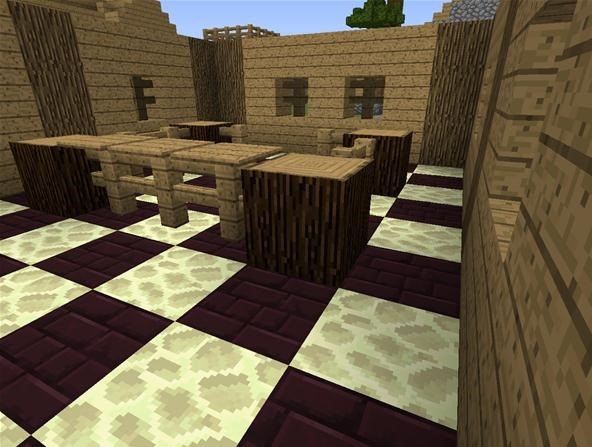 In the example below, I used the 4 types of wooden planks. Other blocks also look great in this pattern. A good use for this is a waiting/sitting room. Wool can be used just as a plain, monochromatic carpet. If you create a pattern with it, it gives the floor more depth, and in some cases, makes it look more realistic. Wool carpets work very well in bedrooms and similar rooms. Of the three types of flooring, patterned floors can be the most diverse and unique. There are many more styles than just what I covered here, and the five I went over can be altered and modified. However, do not just add a patterned floor for no reason. They can also make a build look crowded and messy.